Greeting every young shopper who wonders if they can just order a mattress online, one that will arrive in a box somehow small enough to fit through their apartment elevator, is a hip and slick mattress company announcing that this is in fact possible, thanks to their heroic efforts alone. "Tuft & Needle is a bootstrapped, Phoenix-based company that pioneered the disruption of the mattress industry," Tuft & Needle says about itself. "Founded in 2012 by John-Thomas Marino, 31, and Daehee Park, 28," two Silicon Valley entrepreneurs, "T&N is leading the revolution against unfair mattress markups." The revolution has been well-publicized. 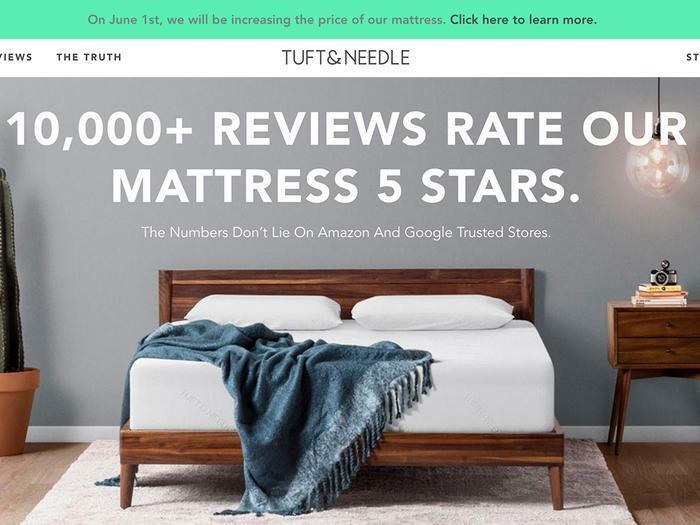 "If Warby Parker could disrupt the eyewear business and TOMS the footwear market, why not use technology to try to disrupt mattresses?...The result is Tuft and Needle," wrote Fortune Magazine, just one of many magazines to report on Tuft & Needle's disruptive mattresses. Now Brooklyn Bedding has an Instagram endorsement from Kevin Jonas of Jonas Brothers fame, who promotes a photograph of his mattress, still in its impossibly small box, with the company's hashtag, #bestmattressever. Not to be outdone, Casper Sleep launched in 2014 with an estimated $70 million raised in venture capital. Investors included actor-turned businessman Ashton Kutcher and rapper Nas. Now Casper mattresses can be seen on display at the South by Southwest musical festival and on the Instagram account of Kylie Jenner. Casper COO Neil Parikh framed the idea for his boxed bed company this way an interview with Inc Magazine: "Let's disrupt the mattress industry. It's broken." Casper's founders told the press it occurred to them, almost suddenly, that there is no way to carry a queen-sized mattress up to a fourth-floor New York City apartment. "We said, 'What if we could compress a mattress to fit into a box the size of a dorm refrigerator?'" The growth of the boxed bed industry is both amusing and a source of pride to Susan Chase and Mary Thomas. Their father Bill Bradley, an 84-year-old welder who still goes to work every day, trademarked the phrase Bed-in-a-Box in 2006, records show, well before the better-known competitors who claim to have developed this idea entered the fray. He and a business partner created their own machine to compress the mattresses and in 2007 began selling the boxes directly to consumers from the web, well before it was considered normal to do serious shopping online. "It's not really a new way,” Thomas says. The sisters will ping their company lawyer when they catch a competitor using the phrase “Bed-in-a-Box.” A cease-and desist letter will get the offending company to change the wording to something like mattress-in-a-box, which is not trademarked. 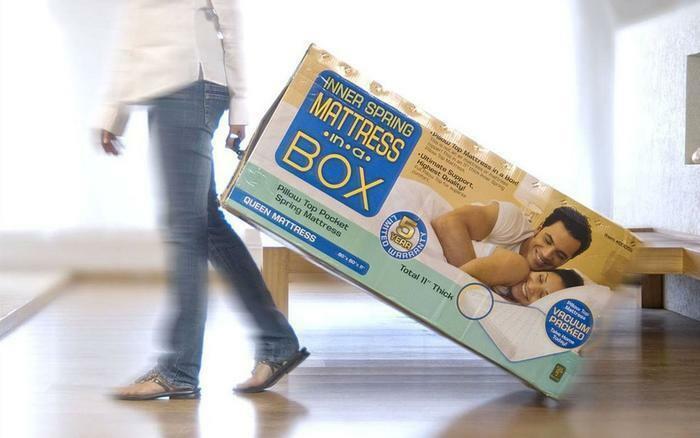 As long as the competitor respects the family’s “Bed-in-a-Box” trademark, the family will leave the rest alone. Armed with degrees in industrial art and chemistry, Bill Bradley owned a fabrication company and worked as a manager for a brick company when he was younger. He later purchased a machine shop. "Anything that needed to be built out of metal, he built it,” Thomas tells ConsumerAffairs. The Bed-in-a-Box he eventually trademarked in later years did not come without previous inspiration. The idea of compressing mattresses into a small box was actually something that Bradley’s business partner had seen companies in China do. But Bradley and his partner wanted to roll-pack higher quality mattresses, produce the mattresses in the United States and use the Internet to sell them. The sisters agree to describe the compression process in layman's terms: the mattress is heat-sealed, which compresses all of the air out of the memory foam. It is then shrink-wrapped to hold its circular shape and stored in a heavy-duty duffel bag. Once the mattress is removed from the packaging by the customer, it takes the atmosphere of the air with it and literally grows before a customer’s eyes. The sisters say that Bed-in-a-Box averages $20 million annually in sales. Their factory and offices in Johnson City, Tennessee employ 35 people.The memory foam is produced by a company in North Carolina, but the sisters say that nothing else in the production process is outsourced. They estimate that they have sent around 100 cease-and-desist letters to the other boxed mattress companies who have advertised with the “Bed-in-a-Box” phrase. "It’s important for us to protect our name and protect our brand,” Chase says. "The other things we have pioneered, that really caught on, are being the first to offer the online sleep trial with no hassle returns," Medansky says. (Tuft & Needle says all their returned mattresses are donated to charity). Tuft & Needle’s stylish online advertising and business model is clearly a hit. Last year, their sales reached $100 million, Medansky says, more than double $40 million from the year prior, and vastly outpacing its $8 million the year before that. Like the family behind Bed-in-a-Box, Medansky credits the competition that came on later with boosting the industry as a whole. "With their funding, they were able to make a lot of noise," she says of Casper. “I think all of the companies that have come after us have really helped prove this concept, and really what we set out was to change the mattress buying experience." Casper, on the other hand, is not as generous in its characterization of the competitors. During South by Southwest this year, advertising executives piled on praise for Casper as reporters listened and tested out Casper mattresses themselves. It was just the latest peek into the trendy company's successful advertising and media campaign. Casper has been the star of the boxed mattress media buzz since it launched in 2014, immediately getting a wave of celebrity endorsements, and is still regularly written about, recognized as one of the “most innovative” companies by Fast Company in February and then featured in Architectural Digest the following month. “For a specific yet sizable market in the United States, Casper is utterly synonymous with the word mattress,” the magazine gushed. Casper chief executive Parikh told the Digest that the company faced hurdles initially when it launched in 2014. “Almost everyone said ‘no one will ever buy a mattress online’ but we set out to prove that that's not true, especially if you offer amazing service and you have the best product,” Parikh said. With its glowing reputation, a reported 250 employees in multiple cities and “hundreds of millions of dollars” in annual sales, one might assume that Casper would have little interest in what professional mattress bloggers have to say about the company, but one would be mistaken. “In early 2014, Casper launched as an innovative new sleep start-up, radically disrupting the traditional mattress industry with one mattress sold directly to consumers online with a risk free in-home trial—eliminating mattress stores and their inflated prices,” the company wrote last year in a federal lawsuit. Casper filed suit in federal court in 2016 against the review site Sleepopolis and then followed with lawsuits against two more mattress review sites. While the legal fight itself focuses on the technical boundaries between honest online reviews and online advertising, the suit also gives Casper the opportunity to further assert its role as chief disruptor of Big Mattress. In comes Derek Hales, the operator of Sleepopolis. Casper writes in its suit that independent product review sites such as Sleepopolis have an important role in the e-commerce industry, as shoppers are now similarly doing their research online instead of in the store. They charge that Hales is taking advantage of this, misleading consumers with his reviews, and that he makes his money off the site by directing customers to affiliate partners--or mattress companies which have paid him. Therefore, they argue that the unbiased reviews he is presenting to the public are really just a form of advertising, potentially violating FTC guidelines. Hales declined an interview. On his website, he portrays the legal fight as a fight to assert his First Amendment rights. "The lawsuit has already taken a heavy personal and financial toll, but I refuse to be bullied or silenced," Hales writes online. He also provides readers with links to the federal court documents. On his site and in court, Hales says that he makes sales commissions off of “referral links,” or links to mattress companies. Should a customer purchase a mattress that came from a Sleepopolis link, Hales receives a referral fee, but he says that fee does not influence his reviews. 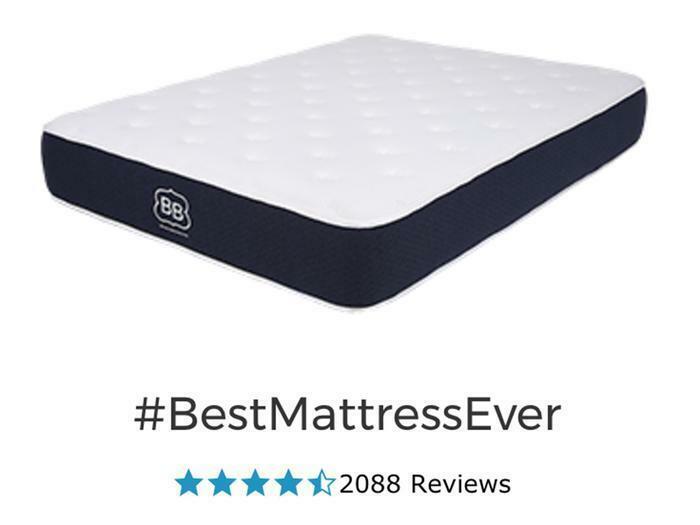 “Hales has been mildly critical of Casper’s mattresses,” he writes in court filings, referencing reviews in which he told readers that he felt Casper charged too much for its boxed mattresses. (With a king mattress for $950, Casper mattresses are vastly cheaper than the $3,000+ mattresses found in traditional stores, but not as cheap as some of the newer boxed mattress competitors). “A Sleepopolis visitor who looked only at the facts asserted in Hales’ reviews would have seen that the Leesa, Brooklyn Bedding, and GhostBed mattresses Hales compared were all less expensive than Casper’s, and at least as fully-featured as Casper’s,” Hales continues in court filings, referencing some of the cheaper boxed mattress companies. Casper forwarded an interview request from ConsumerAffairs to a spokeswoman at a public relations firm, who said the company had declined the request. They did not return follow-up questions from ConsumerAffairs. In the federal lawsuits, which are ongoing, Sleepolis and Casper continue to tussle over the difference between protected speech and commercial speech and which category Sleepopolis falls under. Whatever happens with the suit, at least one thing is clear. Everyone wants to claim credit as the chief disruptor in the boxed bed industry. To Bed-in-a-Box, the original Big Mattress disruptor, it's obvious that competitors like Casper and Tuft & Needle have better funding and are doing a volume in sales that Bed-in-a-Box can’t compete with. But they don’t sound too bitter about it. "I think we can all work together in this particular industry to provide a positive customer experience,” Thomas says.